Pav Bhaji is a a very popular Indian fast food dish common in Mumbai. Pav means bread and bhaji means mashed vegetable dish. It is a spicy preparation with mixed vegetables in tomato gravy, topped with a dollop of butter. It is served with pav toasted with butter. 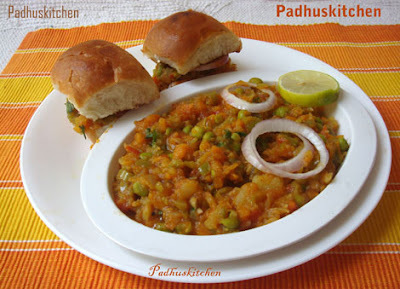 It is easy to make Pav Bhaji at home. 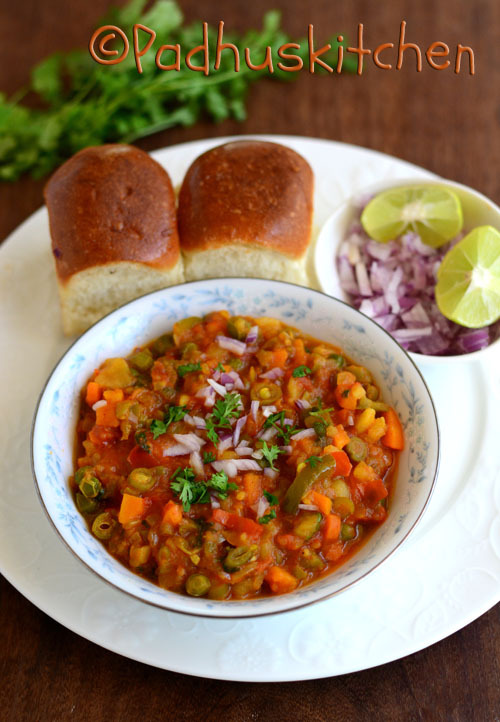 Today let us learn how to prepare Pav Bhaji at home following this very easy recipe with step wise pictures. Pressure cook potatoes, peel the skin, mash it slightly and keep it aside. Grind ginger, garlic and green chilli to a paste. Steam cook beans, carrot and peas with a little salt or you can pressure cook keeping it in a vessel (do not add water to the carrot + beans + peas) inside the cooker for 1 whistle alone (See picture below). Heat oil + butter in a pan, add finely chopped onions and saute stirring continuously till golden brown. Add a little salt to speed up the process. (you can season 1/2 tsp of cumin seeds if you prefer). Now add ginger + garlic+ green chilli paste and saute for a few minutes. Add carrot, beans, peas and capsicum. Add chilli powder, turmeric powder and pav bhaji masala and mix well. Add potatoes, needed salt, water needed and mix well. Cook covered on low heat for 10-15 minutes. Then mash the bhaji well with a masher. Bhaji should neither be thick nor thin, so add water accordingly. Cook for another 2-3 minutes on low heat. Garnish with finely chopped coriander leaves and add 2 tsp of butter on top. Delicious Bhaji is now ready to be served. Slice pav horizontally. Apply butter on both sides and toast pav until brown on both sides. Serve with hot bhaji topped with finely chopped raw onions and few drops of lemon juice. You can also sandwich pav with bhaji and serve as seen in the picture below. Yum, we love pav bhaji! I usually add cauliflower. Do you have a favorite pav bhaji masala brand, or do you make the spice blend yourself? Love this. Always my favorite in chaats. Everyone's favorite. Thanks for sharing.. Nice Pics.. The pav bhaji looks so irresistable. Yummy!! all time fav!! i usually stir it up on lazy days...would like to try ur version! An all time family favourite, urs look very tempting and tasty,nice presentation. Happy to know that ur blog is back in full swing. I'll never resist this, my favourite street food. Looks absolutely yumm. Blog looks very nice..i am happy to follow your wonderful blog..
slurrrrrrrrrp...my fav. weekend eat! well prepared and presented!! Looks wonderful and sure would have tasted good. Drool worth recipe. Nice presentation. Yummy pav bhaji ...I just love the flavour of the bhaji ..looks delicious! Yummmmmmmm! All time fav recipe and yours is outstanding! Lovely recipe...First time here. Love ur space and happy to follow u.
Hi padhu, how are you?recently I made vegetable biryani, vegetable fried rice ,lemon rice and rava kesari sweet .all recipes came to well.my in-laws are coming to my house.I want to make special for them.so I want to try pav bhaji.Everest pav bhaji masala is good or not?please suggest the which brand of pav bhaji masala is best ? Everest pav bhaji masala is good. I used only that for this recipe. I do not know about other brands. Sarika Suman -Thanks for liking my recipes and glad to know that the recipes turned out good. Instead of capsicum you can use cabbage.boil the all the vegetables in a presure cooker at same time so time will be saved..tomatoes instead of boil we can make puree it gives nice taste and red colour. 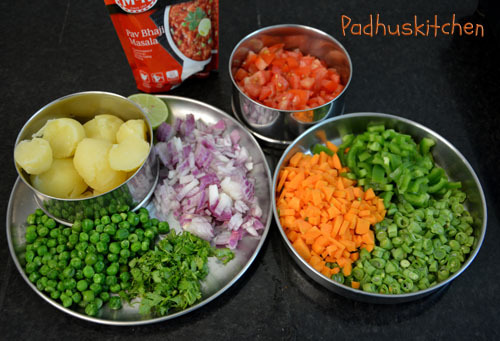 Hi padhu, I usually see your website for any doubt in my cooking and you're awesome... Thanks a lot for all the recipies, I mostly tried pavbhaji and other North Indian side dishes and some chutnies.. very easy to follow.. thanks again.. Yes, you can add tomato puree.